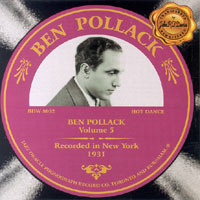 The fifth of six volumes devoted to the complete recordings of Ben Pollack’s Orchestra from 1926 to 1934. Includes related recordings released under the names of Gil Rodin, Jack Teagarden and the New Orleans Ramblers. The extensive liner notes were written by Joe Showler, a Toronto-based expert on Pollack and Jack Teagarden. Charlie Spivak-Sterling Bose (t), Jack Teagarden (tb,v), probably Jimmy Dorsey (cl), Gil Rodin (as), Eddie Miller (ts,v), Gil Bowers (p), Nappy Lamare (bjo,gtr,v), Harry Goodman (sb), Ray Bauduc (d), Eddie Gale (v). Note: Broadway 1444 is credited to Rob Golden and His Orchestra. Ben Pollack (v) dir. Charlie Spivak-Sterling Bose (t), Jack Teagarden (tb,v), Benny Goodman (cl,as), Gil Rodin (as), Eddie Miller (cl,ts), Alex Beller (vln), Gil Bowers (p), Nappy Lamare (gtr), Harry Goodman (bb,sb), Ray Bauduc (d), Eddie Gale (v). Ben Pollack (v) dir. Charlie Spivak-Sterling Bose (t), Jack Teagarden (tb,v,sp), probably Jimmy Dorsey (cl), Gil Rodin (as), Eddie Miller (cl,ts), Alex Beller (vln), Gil Bowers (p), Nappy Lamare (gtr,sp), Harry Goodman (sb), Ray Bauduc (d). Charlie Spivak-Sterling Bose (t), Jack Teagarden (tb,v), Jimmy Dorsey (cl,as), Gil Rodin (as), Eddie Miller (ts), Alex Beller (vln), Gil Bowers (p), Nappy Lamare (gtr), Harry Goodman (sb), Ray Bauduc (d), Ben Pollack (v). Ben Pollack (v) dir. Charlie Spivak-Sterling Bose (t), Jack Teagarden (tb,v,sp), Benny Goodman (cl), Gil Rodin (as), Eddie Miller (ts), Alex Beller (vln), Sammy Prager (p), Nappy Lamare (gtr,sp), Harry Goodman (sb), Ray Bauduc (d). Charlie Spivak-Sterling Bose (t), Jack Teagarden (tb), probably Jimmy Dorsey (cl), Gil Rodin (as), Eddie Miller (ts), Gil Bowers (p), Nappy Lamare (bjo,gtr), Harry Goodman (sb), Ray Bauduc (d), Eddie Gale (v). Ben Pollack dir. Charlie Spivak-Sterling Bose (t), Jack Teagarden (tb,v), Benny Goodman-Gil Rodin (cl,as), Eddie Miller (cl,ts), Alex Beller (vln), Gil Bowers (p), Nappy Lamare (gtr), Harry Goodman (bb,sb), Ray Bauduc (d), Eddie Gale (v). Ben Pollack (v) dir. Charlie Spivak-Sterling Bose (t), Jack Teagarden (tb), probably Jimmy Dorsey (cl), Gil Rodin (as), Eddie Miller (cl,ts), Alex Beller (vln), Gil Bowers (p), Nappy Lamare (gtr), Harry Goodman (sb), Ray Bauduc (d).